The Green Acres TV show was a 30 minute situation comedy series on CBS about a New York attorney who has always dreamed of being a farmer. He decides to make his dream come true and buys a small run-down farm. Unfortunately, his socialite wife absolutely loves her prim and proper life in their Manhattan penthouse apartment and considers her husband's decision to be a nightmare. His friends and family all think he's gone crazy! Two to Four pigs were used on the TV show each year for "Arnold the Pig". The first one was male and all the others were female. Eva Gabor was married 5 times and once said, "Marriage is too interesting an experiment to be tried only once." Bea Benaderet had starring roles in several other TV shows including "The George Burns and Gracie Allen Show", "The Beverly Hillbillies", and "Petticoat Junction". She also starred as Mrs. Atterbury on the, "My Favorite Husband Radio Show" starring Lucille Ball. Lucille Ball actually wanted Bea to play the role of Ethel Mertz on her series, "I Love Lucy" but Bea couldn't do it due to her contract with the "George Burns and Gracie Allen Show". Unfortunately, Bea died during Green Acres' time on the air. They explained her disappearance by saying that she went off to visit her sister. In her final "appearance" her character was actually played by a "stand-in" that was only shown from the back and had no lines. Everyone who watched Green Acres remembers Arnold the pig but there were many other named animals on the show. At one point or another during the show's run the Douglases had a cown named Eleanor, a duck named Drobney, and a dog named Mignon. Mr. Haney also had a dog named Cynthia who just happened to be in love with Arnold the Pig! Eddie Albert was a circus trapeze flier before becoming a stage and radio actor. The idea for this TV show was conceived from the 1950s radio program, "Granby's Green Acres" but the TV show is considered a "spin-off" of the series, "Petticoat Junction". Several of the Green Acres characters had appeared on Petticoat Junction before Green Acres ever aired. Both series took place in and near the same town. Characters from both series often showed up on the other series. There was also an exchanging of characters between Green Acres and "The Beverly Hillbillies". 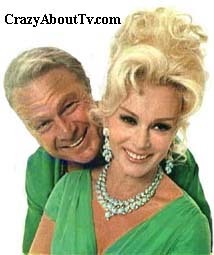 Performed By: "Eddie Albert" and "Eva Gabor"
Thank you for visiting our Green Acres TV show page!